I’ll miss that angry old man. Coughlin was a strange coach to have for so long. On the whole it seems like most Giants seasons ended with terrible disappointment, interspersed with two incredible moments of absolute glory. The Giants, under Coughlin, were really bipolar. The Giants never won a playoff game, except the two times they won them all. The Giants have only made the playoffs once in the past 6 seasons, and they won the Super Bowl. Each game was a completely unexpected experience. I had no idea what to expect from the Giants at any given point. They could go into games against teams they should have beaten and crap themselves. They could go into games they had no business winning and win. It was almost easier to be a pessimist about the Giants every year, and god knows many of us Giants fans became them. That was the thing with Coughlin. You could never tell if he was truly the great coach. The Giants would make terrible mistakes and mess up routine things like clock management. Then they’d play a perfect game. Coughlin would get touted as a man who can fix anyone’s fumble problems because he fixed Tiki Barber. Then Ahmad Bradshaw couldn’t hold onto a ball. 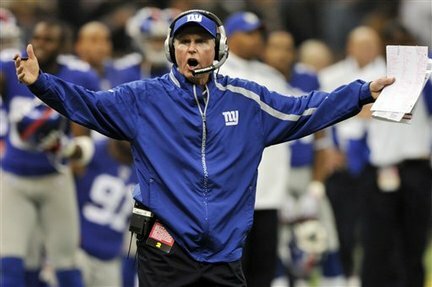 Nor did David Wilson, who spent most of his short tenure in Coughlin’s doghouse. His 5 minutes early rule is still obnoxiously silly (to me and at least still to Strahan). The Giants remained a flawed team under Coughlin, and as a consequence we called for his head more often and more readily than we probably should have. I think only in recent seasons, when the Giants finally put up losing records and faced impossible injuries and subpar general management that we really started to appreciate what an incredible coach he was. And he really was an incredible coach, flaws and all. You could even argue his past few seasons, his worst record-wise, were some of his greatest coaching jobs. In 2013 the Giants started 0-6. They finished 7-9. I still think that is incredible and is probably the moment I began to fully believe in him. Most teams would have given up, but he got the Giants very briefly into playoff contention that season after starting 0-6. The problems the team has faced these past few seasons and the Giants have kept pushing and fighting anyway. The Giants were flawed under Coughlin, not everyone can be Bill Belichick, but they were a good team, and Coughlin was a good coach. Hell, he was great. It’s hard not to feel like the Giants might have made a mistake finally pushing him out. At least pushing only him out. Jerry Reese does not deserve to stay if Coughlin goes. Maybe it was time to move on. The Giants mental collapses this year were frightening and it kind of reminds me of the end to Andy Reid in Philly. Andy is a great coach, but it was time for him to go. Maybe this is indeed Coughlin’s time to go. Maybe he deserved another year. It’s too late now. Thanks to Tom the Giants are the only team to win a Super Bowl in 4 straight decades. Thanks to Tom Giants fans can troll Pats fans forever with 18-1 jokes. Thanks to Tom Eli developed into a worthwhile QB who was just like him, an up and down confusing thing to watch that when ultimately looked back on should be admired. I feel terrible for Eli. Watching him struggle back tears during Coughlin’s final presser was heartbreaking and it really shows just how much Tom meant to him, and how much he likely means to so many of the players he’s coached. Eli has to go through his remaining good years with someone new. After so many years of thinking he’d finally be gone, knowing that he is makes everything strange. I’ll miss his angry yelling. I’ll miss that pose he makes when something he doesn’t like happens, that classic arms wide, mouth agape in angry confusion pose. You know the one. Yeah, that one. I’ll never forget him yelling at Greg Schiano. Or the fact that his first head coaching job was at RIT, my Alma Mater, a school nobody knows about because all the alumni are shut in nerds. Or that one time his face froze in Lambeau. Or his impossible to turn off Coach Speak way of talking. Seriously, any interview with the guy, even about not-football, he sounds like a football coach dad trying to get you to understand to play your hardest. You were a class act Tom. Thank you for everything you did for the Giants, for Football, and for anyone you’ve touched personally. Take the time off. Spend time with your enormous family. They deserve you. Also Giants if you hire Spags as his replacement I swear I will punch a voodoo doll labeled Jerry Reese on camera for the internet. This more than answered my question from Tuesday’s post harhar… Great post. I pretty much feel the exact same way about all of it. 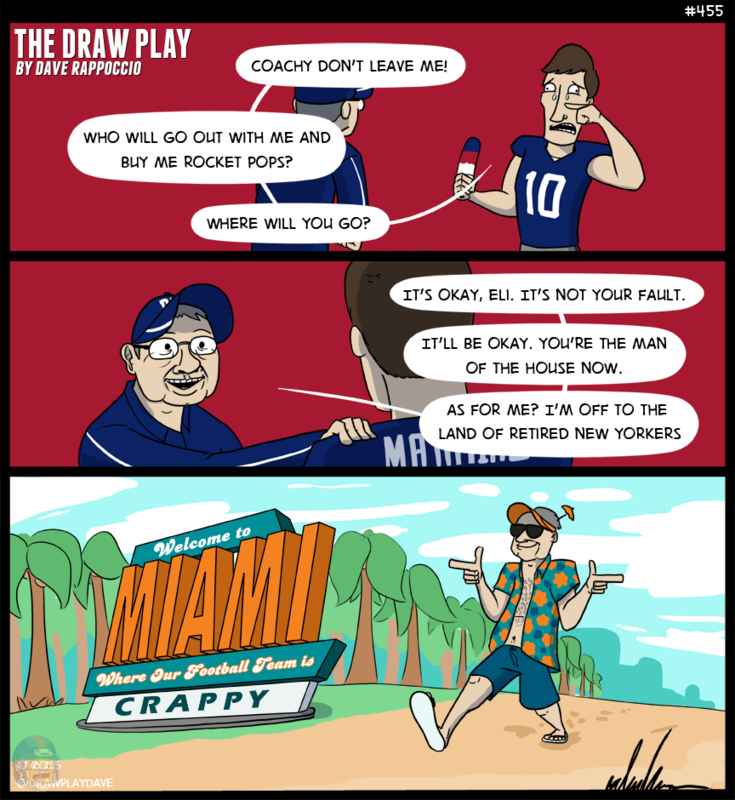 3 comics in a row about fired coaches, your job is super easy right now! Obviously his next comic has to be about the Bucs firing Lovie Smith. Because seriously that was weird. I think I’ll miss most of all his red face during December and January. I’m a Pats fan, and although I’ll always hate the Giants for what they did, I’ll still always respect Coughlin as a coach. Hopefully he gets a job somewhere. It was probably Coughlin’s time to go, though I have no doubt that he was (and is) a great coach. Still, I have a feeling there will be some Giants fans listening to Cinderella in the near future. I already miss Tom. I do feel we should have given him another year. I wanted to see at least one more year under him where half our team wasn’t on IR. I agree with you Dave that people called for his head far too often, but that’s part of being a New York coach. It was tough to watch Eli’s reaction. That whole interaction between Tom and Eli during the press conference was something out of a movie. 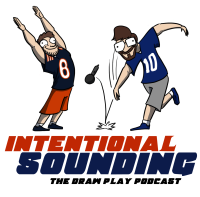 Plus Eli saying that the players failed Tom, not the other way around. One more thing Dave, Strahan has definitely come around on the 5 minutes early. He makes a big point of setting his watch ahead now and always being early. Players seemed to really fall into Toms methods once they got a few years of experience, some more wisdom, and saw what he was trying to do. I don’t know about “one more year”, given that they blew a lot of games in the last few minutes. It wasn’t really a problem with the IR so much as it was bad coaching. From my POV on the other side of the Jets-Giants divide I will miss him though. Seemed like a damn good coach, and gave us quite the challenge in the MetLife Bowl this year. Farewell Tom. Yeah, two superbowls. The Giants has been a worse team than the Dolphins in virtually any metric, and 4 years is quite a bit of time. And this is in the NFCE, who have been terrible during those 4 years. Why not Miami? The weather is nice, he’ll have another doofus at quarterback he can mentor and he’ll have the chance to troll Bellichick twice a year. It usually takes a long time for a fan to give credit and respect to players and coaches of opposing teams. If it ever happens. But TC gained my respect. Giants fans: I think you are going to miss TC. TC: Go on to coach somewhere else and be wildly succesful. That would make for some good trolling. I’ll never forget what he did for the Jaguars, I’m a little mad we fired him considering the injuries on our team and not noticing how great of a coach he is. I will miss the stare he gives when something incredulous has happened (or maybe he just remembered he left his crockput on)…you know…when he has his hands on hips and stands there mouth agape…I call it his, “get off my lawn!” look. Hey…wasn’t RIT the birthplace of Kodak? Sometimes it feels like there are more Jets, Pats, and Giants fans down here than Dolphins fans. He did one like this for last year’s playoffs and it was funnier, but I can’t find it anywhere. Coughlin never got the respect he deserved. Simply put, only a handful of coaches won two Super Bowls. As a Saints fan, Coach Payton reminds me of him. Payton is just more revered because it was our first SB (plus the city really needed it, post-Katrina) and Brees is a great QB. I’d take Coughlin’s two rings over any of those offensive records.